As human beings, we all have the universal rights to equality and freedom from discrimination. There is no instance where it is okay to impede these, yet as a transgender individual, I have been made to feel as though I have found a loophole where it is suddenly okay for the systems I navigate in life to throw this out the window. To be more specific, I am referring to OCAD University’s absolute disregard toward my rights to equal treatment both as a human being and as a full time student. Every other bureaucratic system I have dealt with has had procedures in place to accommodate trans people. There is a basic level of sensitivity training that is required in order to provide non-discriminatory service to all members of a community. The Ontario Human Rights Code calls for equal rights and opportunities for all persons, and declares that no one can be discriminated against due to their gender identity or expression. If the older, rather stern and conservative-looking gentleman at the bank was able to change my file to indicate “Mr. Carpenter” without me even needing to ask, then you’d expect that an institution with as astronomically high LGBT population would at least acknowledge the reality of transgender students existing within their student body. My experience with OCAD University’s administrative system has been drawn out, frustrating, one sided, and severely damaging to my mental health and attitude toward my studies. Since coming out after beginning my university career, I’ve had to make adjustments to my personal information while simultaneously being enrolled in the system. My initial request and reason for contacting the office of the registrar was to inquire as to the process for updating my display name on Canvas. On January 6, 2015 I emailed the office of the registrar asking if it would be possible to update this display name to my preferred name, which I clearly detailed in the body of the email. Hello OCAD, please call me William. The school replies a day later by opening with “Hello, [Birthname],” which foreshadowed the direct abuse and inconsiderate attitudes I would face for the next year and a half. The email then goes on to state that my preferred name should be reflected in changes to my Canvas account. I was mildly taken aback by their use of my old name, but overall content with the way OCAD had handled my request in a timely manner. I happily logged on to Canvas expecting to feel a sense of validation at the sight of my shiny new name staring back at me, yet what I saw once the page loaded was the most ludicrous “solution” I had ever seen. I was mortified as I stared blankly at my user info, a feeling of burning shame and panic radiating through me. 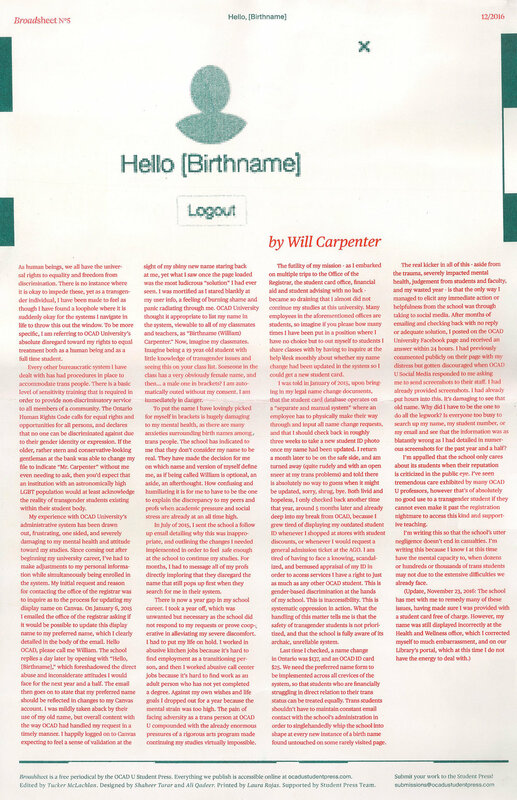 OCAD University thought it appropriate to list my name in the system, viewable to all of my classmates and teachers, as “Birthname (William) Carpenter.” Now, imagine my classmates. Imagine being a 19 year old student with little knowledge of transgender issues and seeing this on your class list. Someone in the class has a very obviously female name, and then… a male one in brackets? I am automatically outed without my consent. I am immediately in danger. To put the name I have lovingly picked for myself in brackets is hugely damaging to my mental health, as there are many anxieties surrounding birth names among trans people. The school has indicated to me that they don’t consider my name to be real. They have made the decision for me on which name and version of myself define me, as if being called William is optional, an aside, an afterthought. How confusing and humiliating it is for me to have to be the one to explain the discrepancy to my peers and profs when academic pressure and social stress are already at an all time high. In July of 2015, I sent the school a follow up email detailing why this was inappropriate, and outlining the changes I needed implemented in order to feel safe enough at the school to continue my studies. For months, I had to message all of my profs directly imploring that they disregard the name that still pops up first when they search for me in their system. There is now a year gap in my school career. I took a year off, which was unwanted but necessary as the school did not respond to my requests or prove cooperative in alleviating my severe discomfort. I had to put my life on hold. I worked in abusive kitchen jobs because it’s hard to find employment as a transitioning person, and then I worked abusive call center jobs because it’s hard to find work as an adult person who has not yet completed a degree. Against my own wishes and life goals I dropped out for a year because the mental strain was too high. 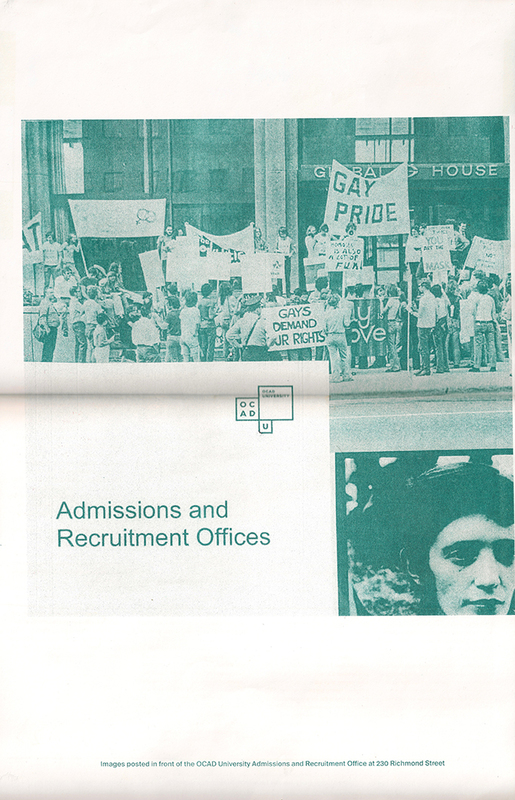 The pain of facing adversity as a trans person at OCAD U compounded with the already enormous pressures of a rigorous arts program made continuing my studies virtually impossible. The futility of my mission -- as I embarked on multiple trips to the Office of the Registrar, the student card office, financial aid and student advising with no luck -- became so draining that I almost did not continue my studies at this university. Many employees in the aforementioned offices are students, so imagine if you please how many times I have been put in a position where I have no choice but to out myself to students I share classes with by having to inquire at the help desk monthly about whether my name change had been updated in the system so I could get a new student card. I was told in January of 2015, upon bringing in my legal name change documents, that the student card database operates on a “separate and manual system” where an employee has to physically make their way through and input all name change requests, and that I should check back in roughly three weeks to take a new student ID photo once my name had been updates. I return a month later to be on the safe side, and am turned away (quite rudely and with an open sneer at my trans problems) and told there is absolutely no way to guess when it might be updates, sorry, shrug, bye. Both livid and hopeless, I only checked back another time that year, around 5 months later and already deep into my break from OCAD, because I grew tired of displaying my outdated student ID whenever I shopped at stores with student discounts, or whenever I would request a general admission ticket at the AGO. I am tired of having to face a knowing, scandalized, and bemused appraisal of my ID in order to access services I have a right to just as much as any other OCAD student. This is gender-based discriminated at the hands of my school. This is inaccessibility. This is systematic oppression in action. What the handling of this matter tells me is that the safety of transgender students is not prioritized, and that the school is fully aware of its archaic, unreliable system. Last time I checked, a name change in Ontario was $137, and an OCAD ID card is $25. We need the preferred name form to be implemented across all crevices of the system, so that students who are financially struggling in direct relation to their trans status can be treated equally. Trans students shouldn’t have to maintain constant email contact with the school’s administration in order to single-handedly whip the school into shape at every new instance of a birth name found untouched on some rarely visited page. The real kicker in all of this -- aside from the trauma, severely impacted mental health, judgement from students and faculty, and my wasted year -- is that the only way I managed to elicit any immediate action or helpfulness from the school was through taking to social media. After months of emailing and checking back with no reply or adequate solution, I posted on the OCAD University Facebook page and received an answer within 24 hours. I had previously commented publicly on their page with my distress but gotten discouraged when OCAD U Social Media responded to me asking me to send screenshots to their staff. I had already put hours into this. It’s damaging to see that old name. Why did I have to be the one to do all the legwork? Is everyone too busy to search up my name, my student number, or my email and see that the information was as blatantly wrong as I had detailed in numerous screenshots for the past year and a half? I’m appalled that the school only cares about its students when their reputation is criticized in the public eye. I’ve seen tremendous care exhibited by many OCAD U professors, however that’s of absolutely no good use to a transgender students if they cannot even make it past the registration nightmare to access this kind and supportive teaching. I’m writing this so that the school’s utter negligence doesn’t end in casualties. I’m writing this because I know I at this name have the mental capacity to, when dozens or hundreds or thousands of trans students may not due to the extensive difficulties we already face.